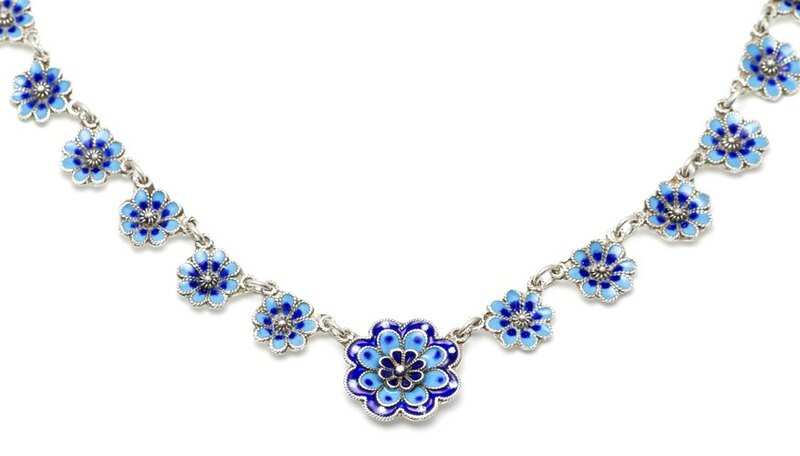 The range of colors and versatility of enamel can make crafting enamel jewelry artistically satisfying. Enamel is basically glass that has been melted onto metal, and powdered enamels are available at specialty stores or on the Internet. Enamel powders are already colored and can be opaque or clear. As the enamel powder needs to be heated to at least 537.8 degrees Celsius (1,000 Fahrenheit) in order to melt, a kiln, MAPP torch or a lampworking torch is needed. Preheat the kiln. Clean and dry the metal base completely. Apply the enamel powder to the base using the sieve or a small brush. The enamel layer should be no more than half the thickness of the base and should be slightly thicker at the edges than at the middle. Place the enameled piece on the slide, taking care not to disrupt the powdered enamel. Put the piece in the kiln on the firing tray or supports. Wait until the enamel is glowing slightly red and has a smooth surface. Remove with the slide and place on a heatproof surface to cool. Clean and dry the metal base. Place the base on a mandrel. Turn on the torch and hold the base in the flame until the metal begins to glow. Dredge the hot metal base through the enamel powder. Repeat three times. Remove the enameled piece from the mandrel and place on a heatproof surface to cool. Allow the piece to cool completely. Gently file off any spots on the metal that oxidized or turned dark in the heating process, using the metal file or steel wool. Work away from the enamel to avoid cracking the enamel. Wash off dust from the filing process and polish the metal until it shines. Dust, grease or dirt of any kind will affect enamels, changing the color or causing spots. Always work on a clean surface. Different colored enamels have different firing temperatures and times; check the label on the enamel. Place a clean piece of paper under the base while applying enamel powder to catch excess enamel. Always have a heatproof surface when using a torch. Butane torches do not get hot enough to melt enamel. Never touch hot enamel pieces. Always keep water on hand in case of burns or other emergencies.